From the time I was in the 2nd grade, my mom would take us to Church. It was a chore, just something I had to do. I never made a connection with God. I can not recall my dad ever going to church. The years passed, I met Janell and we were married in Sept of 1973. I don't recall that we ever discussed God and our relationship with Jesus before we were married. I was undecided what role God played. I suspected that there was a God, but that was about the extent of what I believed. Janell became pregnant with our first baby in May of 1976. We were both looking forward to being parents and Janell found an obstetrician she felt comfortable with. I went with Janell to the pre-natal classes and participated with her in the Lamaze classes for childbirth. I was going to be in the delivery room. We had picked the name of Lesley for our new baby girl. On February 11th 1977 Janell went to her doctor for a check up as she was close to the delivery date. The doctor gave Janell a shot of Pitocin to induce labor. Janell was told that if she was ready, she would go into labor and if not, nothing would happen, and she was sent home. Later that evening, Janell started getting severe pains in her abdomen. It did not seem to be normal delivery pains so I rushed Janell to the hospital. Janell was placed in a labor room and her water broke. There was blood in the fluid. In the pre-natal classes we were told that if the water broke and there was blood in it to get to the hospital immediately. We were at the hospital already so I felt that the situation would be taken care of. The doctor came in and she made a comment,  Where did all this blood come from, and then proceeded with a normal delivery. When the doctor realized that we were losing the baby she finally decided to be a little more aggressive, and finally Lesley was born. The doctor stated that we had a problem when she saw Lesley and let it go at that with no further explanation. I did not realize it at the time, but due to the shot Janell had been given earlier, the placenta had separated and Lesley had been suffocating ever since Janell's water broke. I had to give the pediatrician permission to tranquilize Lesley. Due to the seizures from the injury to the brain her arms and legs were moving like she was running a race and she would basically run herself to death. As I gazed through the glass, watching my baby girl struggling to live, I prayed that she would be all right. That she would get well and be a healthy baby girl. God did not answer my prayer. We were told that Lesley had massive brain damage and would probably have to be put in an institution. Once she was stabilized we took her home. I became very angry that God let this happen to my baby. I felt that if there was a God, he was not just and I did not need Him. I got to one point where I decided that there was no God at all. How could there be a God with all the bad stuff happening in the world, and to my baby daughter? I denied His existence. Janell convinced me that we should have another baby so Lesley could have a sibling and we could have a healthy child. On April 27th. 1979, we had another baby girl by cesarean section. We named her Lauren. 4 years passed and Janell convinced me that we should have one more child and this time we would have a boy. On April 28th. 1983, Colin was born by cesarean section. Lauren and Colin were both healthy kids. I was beginning to realize, now that Lesley was 6 years old, that she was not going to be retarded. She was diagnosed as having Cerebral Palsy. 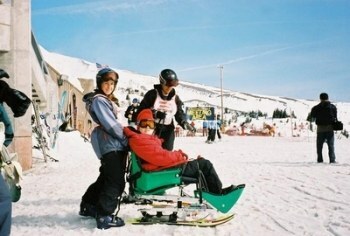 A severe case of Cerebral Palsy. No fine or gross motor skills and she was non-verbal. Janell would take the kids to church regularly, but I would not attend. Janell had always had a strong relationship with the Lord and she told me that when Lesley was fighting for her life, and she knew that Lesley was going to be hurt, that God would spare her intelligence, that she would not be retarded. God had answered Janell's prayer and not mine. I was still angry with God, if there was a God, and I still could not understand how a loving, caring God, could let this happen to an innocent little girl. In 1987 Janell and I switched roles. Lesley was in the 3rd grade and I became the stay at home dad and Janell went to work using her education. Over the years, I would go to church with Janell and the kids on special occasions, just because Janell wanted me to and for no other reason. I met a couple of elders at FBC Arapaho during my brief visits and they were always warm and friendly. God was trying to soften my heart even though I did not know it at the time. I finally acknowledged that there might be a God. I decided that God allows a lot of bad things to happen in this world. Not that He makes bad things happen, but He does allow bad things to happen. He could intervene and stop all the bad things, but he chooses not to do so. I still did not think that God did anything for me personally. I was in control of my life and God must be somewhere, doing something, but I had no clue what that might be. I still had no use for Christians in general as I did not think we had anything in common, and they were way too straight laced and uptight for me. 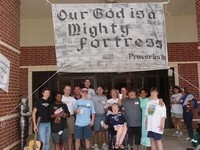 In 1998 someone gave Lesley a flyer about JAF Camp Allen in Navasota Texas, which was not far from Houston. 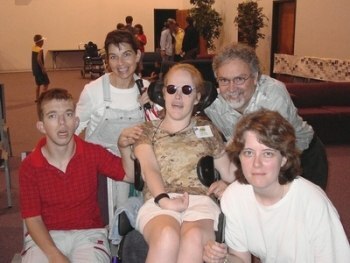 Joni and Friends Ministries had a camp for families with a disabled or special needs person and Lesley wanted to go. I tried to talk her out of it. I tried to help her forget about it but did not succeed. As the date was getting closer, a volunteer contacted Janell. Denise Lindgren from Fellowship Bible Church on Arapaho was volunteering to go to camp and be with Lesley and help her have fun. Janell worked during the day, and I was Lesley's main caretaker on a day to day basis. Since there was no one else to take Lesley to camp and take care of all her personal needs, and since it was designated a family camp, I reluctantly decided to take her. I knew that Denise would not have any idea how to communicate with Lesley or help her do any activities without some instruction and guidance from someone. My main goal was going to be to teach Denise how to communicate with Lesley and learn how to help her. When the time for Camp Allen arrived, I still did not want to go. I decided I would go and help Lesley have a good time just by getting her there. I figured that I would fade into the shadows and basically be invisible for a week and at the end of that time, bring Lesley home. I thought that would be the end of that story. I did not know that it would be impossible for me to be invisible at Camp Allen. When we arrived, we were immediately thrown into the spotlight. We received a big fanfare and greetings from many Short Term Missionaries. Clowns and cheering and a person on a microphone and where are you from and we are glad that you are here. That was a very big shock to my system as I am the basic introvert, and make friends slowly. I felt very uncomfortable among the crowd of people even though everyone was outgoing and friendly. I felt that I did not have any thing in common with these folks. After all, they were Christians. I was put on the spot several times when asked what church we were from. I confessed that I rarely attended, but Lesley was from the FBC Arapaho. I was still received warmly from everyone who spoke to me and it helped to make me a little less nervous. Denise was eager to learn how to help Lesley even though it was obvious that she was a little intimidated by Lesley's disability. I decided to go along with how things were structured and since I was supposed to do certain things at specific times I decided to play along. One of the functions I was supposed to participate in was a meeting of a small group of men. These were other dads who were attending camp and a group leader was assigned to the group. As we were beginning our meeting, it was decided that we would go around the circle and tell who we were, and why we were there and what we expected to get out of the week. I was very glad when the first guy started and it was obvious that it was going away from me and I would be last or close to it. I was very nervous. What was I going to say? I had no clue. I was sweating bullets. It was obvious that these guys were Christians and had a good sense of God and who He was. When it came my turn, I told them a little about Lesley's disability, that she has no gross, or fine motor skills but has average intelligence. I told them that she uses signals like raising her eyebrows for yes and that we have an eye-gaze board for communication which allows her to spell out what she wants to say, and that she dragged me there against my will. I was trying to figure out what I could say regarding what I expected to get out of the week when I had no idea of what I expected. The words that came out of my mouth were, I want to become closer to God. Wow, where did that come from, I wondered. Joni was there all week and one day she led the adults in a corporate prayer. She told us to close our eyes and imagine Jesus on the cross, and to turn over all our burdens to Him. As Joni spoke I turned over all my struggles and burdens to Jesus. I placed them at the foot of the cross and asked Jesus to take them all. I don't recall what else I prayed about, but the rest of the week I was filled with such peace. I had never felt anything like it. 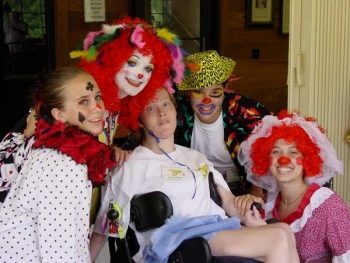 When Lesley and I were riding in the van, headed back to Dallas, I was recalling the events of the wonderful week at Camp Allen. It was like a voice in my ear, sort of tapping me on the shoulder. I didn't actually hear a voice, but it was like the Lord was telling me,  Hey dude, do you realize what happened this week? I made all this happen because I want you to know me. I want you to accept me. I want you to have a relationship with me. I realized that I had witnessed the presence of the Holy Spirit at Camp Allen. My wife and kids could see something different about me as soon as I walked in the front door. I told Janell that I wanted to be baptized and I asked a couple of elders at FBC Arapaho if they would do me the honor. I was baptized on Father's day June 21 1998. I accepted Jesus as my Savior. I believe that Jesus was crucified, and that He died on the cross and rose again. I believe that the only way to the Father is through the Son. God did not make Lesley disabled but he did use her and the situation to get me to Camp Allen where His work could be done. Lesley has been volunteering as a Co-Leader of the Young Adult group for about 4 years and her sister, Lauren has been an STM at JAF Camp for about 4 years also. I am thankful that God used Lesley to get me to JAF Camp. We changed churches and started going to another Fellowship Bible Church on Meadow and Central Expressway. Many of the Short Term Missionaries are from FBCD and the Dallas office for Joni And Friends Ministries is based out of that church. I have often said that there should be a Camp Allen every 3 months or so, so I would not get so spiritually empty by the time camp rolls around the next year. Each year I get filled up again at Camp Allen and I am empty a few months later. I have been trying to figure out how to keep that peace and joy that God gives me, all year long. I have determined that putting God first in my life is the key and I have been trying to figure out how to do that. If I put God first in my life on a daily basis and even on a moment by moment basis and especially when I am struggling, He will give me that peace and joy all year long. Fellowship Bible Church of Dallas started the 40 days of Promise campaign and encouraged everyone to GET OFF YOUR ISLAND. It was a message to me from God. I admitted that I had been on an Island. I was not involved in any men's groups. The only Christian men I saw were at church and for a few moments at work before the guy went home. I take care of Lesley during the day and work part time in the evenings and all day Saturday so I did not see where I had much time to fellowship with other Christian men. I decided to join a small group and commit to the 40 days of Purpose campaign. It seemed that Wednesday mornings would be my only time that I could join one so I signed up. I was told that the first Wednesday morning, would be at 6:30. I arrived at the church and the room where I thought I was supposed to be was locked. I walked down to the East End Auditorium and I found several men there. I assumed it was my group, but it turned out to be the Journeymen's group. The Purpose Driven Life meeting would be directly after. God managed to get me to these meetings and it was just what I was needing. I get filled with the gifts of the Holy Spirit every week through Bible study and fellowship with my Christian brothers. The Journeymen's group at 6:30 and the small group at 7:30 were a great gift from God. I have attended regularly since then and I look forward to our Wednesday mornings and the opportunity to grow in Christ. God has been teaching me and helping me to learn a lot of new lessons. He is filling my cup on a day to day basis and I am so thankful for that. I thank God for putting people in my path who help me to grow in Christ. I thank God for my Christian family. I thank God for His sacrifice of His only Son, so that I may know eternal life in His kingdom. I thank God for Joni Eareckson Tada and JAF camp, and the work that is done through her ministry in His name. Lesley has just gotten involved in a ladies Bible study on Wednesday mornings right after I am finished with my Bible study. She has just gotten a Dynavox with the help of my mom, and Lesley is able to communicate with other ladies in the Bible class who don't know all of the signals that she uses with family members, and they don't have to use the eye-gaze board which is a one on one thing. I would have never thought that a young lady who can't talk or write her name with a pencil, would ever be involved in a bible study with group of average ladies. WOW! The Dynavox scans all of the locations and Lesley uses a switch that is built into the headrest and uses it like I would use the click of a mouse. Lesley is able to program any button with whatever words or phrases she wants to say. She is able to use the Dynavox to turn on the TV , Satellite dish, and Stereo and change channels as long as she is pointed at them in her chair. God is good, even when things don't seem to be going the way we would have chosen.